While it's difficult and time consuming, author Paul Gipe finds that measuring small wind turbine noise is within the reach of amateurs and asks why manufacturers and national laboratories are not testing the turbines themselves. An edited version of this article appeared in the Summer 2001 (Vol. 14, No. 3) issue of WindStats Newsletter. Disclosure: Paul Gipe has worked with ANZSES, ASES, AWEA, BWEA, CanWea, DGW, EECA, KWEA, NASA, NREL, USDOE, Aerovironment, the Izaak Walton League, Microsoft, the Minnesota Project, NRG Systems, PG&E, SeaWest, the Sierra Club, and written for magazines in the USA, Canada, France, Denmark, and Germany. Chelsea Green has published two books by Paul Gipe: Wind Power for Home & Business, and Wind Energy Basics. Paul Gipe paid for all products mentioned. In the early 1980s he was a dealer for Bergey Windpower. He also wrote advertising copy for NRG Systems in the late 1980s. Pick up any copy of Windernergie: Marktübersicht (Market Overlook) published by Bundesverband Windenergie. Leaf through its nearly 200 pages of product specifications on wind turbines available in Germany and you are likely to find listings for the noise emitted by popular brands. The listings for sound power level are found right alongside the more familiar measures of rotor diameter and swept area. Or examine a copy of the competing publication, Windkraftanlagenmarkt (Wind Turbine Market). The latter not only lists sound power level, but it also ranks the turbines by "annual production per acoustically constrained area" in kWh/annum/hectare. Clearly, the amount of noise emitted by medium-size wind turbines in the burgeoning German market is an important parameter when evaluating a product. Now, try to find the same data on small wind turbines--on any small turbine. Good luck. Neither German publication lists sound power levels for small wind turbines. Why? Because the data simply doesn't exist, or if it does, it is proprietary, that is, the manufacturer knows, but they won't tell. Most manufacturers of small wind turbines have never heard of sound power levels. Those few that do have either never measured noise from their turbines in a scientifically rigorous manner, or they simply thumb their nose and say "It doesn't apply to us." As an author of books on small turbines, I occasionally field noise complaints. The number of incidents increased markedly with the introduction and subsequent popularity of Southwest Windpower's Air 303 and, later it's 403 model. More than 38,000 of the units are in the field, most in close proximity to their owners, some on rooftops, others on sailboats. While SWP's Air 303-403 models are the most notorious, noise complaints have also arisen from Bergey Windpower products, especially when operating without a load. Other products, such as World Power's so-called "Whisper" line are also not immune. Unfortunately, very few noise measurements have been made on small wind turbines. With this in mind, I set out to measure the noise from an Air 403, a Bergey Windpower BWC 850, and an Ampair 100 operating at the Wulf Test Field in the Tehachapi Pass. The tests were conducted according to International Energy Agency and American Wind Energy Association procedures with the exception that I used a less expensive Type 2 meter than the scientific-grade Type 1 meter specified. Measuring the noise from small wind turbines is every bit as complicated as measuring power curves--and more costly. The measurements require sophisticated acoustical instruments and careful analysis. (For a similar series of tests on small turbine performance, see WindStats Summer 2000, Vol. 13, No.3, Testing the Power Curves of Small Wind Turbines.) However, my experience proves that such measurements can be made by small wind turbine manufacturers, and that it may be possible to make these measurements with instruments no more costly than that used to measure power curves. National wind turbine laboratories in the United States and Europe are fully capable of performing these tests. Indeed the test procedures were developed, in part, at European test fields. These laboratories have the technical skills necessary and some even have acoustical engineers on staff. They also have budgets sufficient to cover the cost of the more precise Type 1 instruments called for in the standards. Yet, national laboratories have never made measurements--of any kind--on small wind turbines a priority. For example, in mid 1999 World Power Technologies was advising its dealers that the National Renewable Energy Laboratory would be conducting noise tests on World Power's Whisper H900, (since renamed the H40). By mid 2001, the report was still not available. 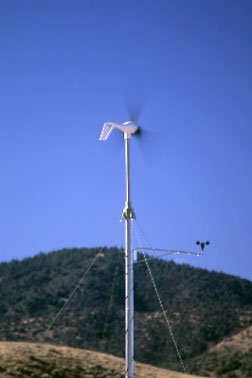 The delay was due in part to the difficulty of measuring noise from small wind turbines, and in part because there had been no imperative at NREL to measure wind turbine noise during the 1990s, and especially no programmatic support to measure noise from small turbines, despite consumer complaints. NREL says the tests are now complete. Noise is critical to siting small wind turbines. Carl Brothers, manager of Canada's Atlantic Wind Test Site, notes that "the smaller they are, the closer they are likely to be placed near the house." "Noise [also] has a lot to do with acceptability," says Mick Sagrillo, one of the founders of the Midwest Renewable Energy Fair and who for many years owned Wisconsin's Lake Michigan Wind & Sun. According to the outspoken Sagrillo, the small turbine industry's objective should be to produce "renewable kilowatt-hours that are user friendly" rather than counting up the number of wind turbines shipped, like so many McDonald's hamburgers. If noise isn't addressed, warns Sagrillo, then the public's wariness toward small turbines will swiftly shift to prohibition. Neighborhood reaction to small turbine noise can also affect how or when owners use their turbine. In Tehachapi, California Bob Morgan furls his Bergey Excel in fierce Santa Ana conditions to please his down slope neighbors. Bruce Hammett, who says jokingly that the four Air 303s he operates vie with a neighboring Harley Davidson dealer. ("Harleys" are an American-made motorcycle noted for its a throaty roar.) Hammett, of WECS Electric Supply in North Palm Springs, made the comment on AWEA's news group after one subscriber posted a message that a newly installed Air 403 was so loud that it panicked two horses in a nearby field. Hammett suggested tongue-in-cheek that the owner "flip the switch to off below Harley winds and it will work like a dream. Otherwise, move the horses." Anecdotes such as these abound both on the internet and in traditional media. In a paper written for a professional meeting, NREL's Jim Green interviewed an owner of a Whisper H900 in Colorado. The turbine was 100 feet (30 m) away but could be heard inside the house when furling in winds greater than 30 mph. Green quotes the occupants as saying the turbine sounded "like the propeller of a small airplane." In another posting on the awea site in early 2001, Robert DeVault noted that during a storm, "a whole new sound was heard" from his Air 403. "It's an indescribable hoarse shriek, sudden and very loud. My cousin could hear it over the roar of the storm one-quarter mile (0.4 km) away through the woods." Southwest Windpower's marketing director Andy Kruse replied ". . . If noise was a serious issue, I doubt we would have sold as many as we have." Maybe, but some owners of the Air turbines didn't realize how noisy they were when they purchased them. Take Niko Horster for example. Horster, is a sales and marketing manager for Chelsea Green Publishing Co. in White River, Vermont. He installed an Air 403 on the top of his three-story barn in August 1999. Though the barn is 100 feet (30 m) downwind from the house, noise from the turbine is problematic. He characterizes it as "normal, loud, and howling." When the turbine begins regulating, he says it causes a "low frequency Brrrrrr." It sounds like a "fighter jet attacking the house. . . I can't sleep" when it's windy, he says. "It's too annoying." Now, Horster simply shuts off the turbine at night. His wife is more critical. She exclaimed, "I hate the thing. Just get rid of it." Admittedly, these are subjective accounts. But as Ken Starcher points out, in the field noise is most often a subjective issue. Starcher, who manages West Texas A&M's Alternative Energy Institute, says "if the sound pisses you off, it pisses you off." You don't need a sound level meter to know that. In a master stroke of simplicity, Starcher devised a technique that recorded the noise emitted by a turbine with quantitative data on wind speed and power. He videotaped an Air 403 operating in strong winds at AEI's test field in the Texas Panhandle. Concurrently, Starcher collected power and wind speed data which was then read into the recorder's microphone. While only a qualitative tool, the videotape enabled Starcher to share with other researchers and the manufacturer the noise characteristics of the turbine under varying wind conditions. Similarly, Michael Klemen, an experimenter in North Dakota posted audio recordings of the noise from two wind turbines, a SWP Air and a small Bergey turbine, on the web. (See sidebar, Audio files of Small Wind Turbine Noise.) Anyone with access to the internet can listen to the audio files of these two turbines operating in strong winds and gain an understanding of their noise signatures. Yet anecdotal reports and audio recordings, useful as they may be, can't answer the question of how noisy are these turbines quantitatively. Nor can they answer the question of how does that noise compare with the noise emitted by medium-size, commercial wind turbines. For example, are small wind turbines relatively more noisy than bigger turbines? NREL's Jim Tangler agrees that "subjective is good," but he adds that "you also want to quantify" results so progress can be gauged. Some data does exist. ECN's Jeroen van Dam reports that Nico van der Borg monitored the noise from a LMW 2.4 (a 2.4 meter diameter, 1 kW turbine) in the 1980s. These were early measurements made at ECN's test field at Petten in North Holland. At the time, ECN was still refining the measurement technique, says van Dam and the results are probably not comparable to those using methods now in use. Van Dam himself measured noise from a LMW 1003 but felt the results were influenced by noise from the turbine's yaw bearing and unrepresentative. David Wood presented a paper at the 1997 Australia-New Zealand Solar Energy Society's conference on measurements made by the University of Newcastle (Australia) on an experimental 5 kW turbine. The tests were made 15 meters from the hub of the turbine at Fort Scratchley. Wood reported measurements of 62-63 dBA from the turbine with ambient noise about 60 dBA. Though the data reflects the influence of the turbine, there was insufficient data to satisfy IEA requirements. Nor was the measurement technique adequately described. The Newcastle results was similar to that often collected by small wind turbine manufacturers, interesting, but of little use. Proven Engineering, a small Scottish manufacturer, took their own in-house measurements, says Gordon Proven, because "We often get inquiries from planners. And in this country you must have permission to put up anything. We have a need for the data," he says. "We just had one [turbine] refused [planning permission]." While the tests were simple, and the data they collected unsuitable for use by British planners, Proven remains one of the few if not only small wind turbine manufacturer that has measured the noise from their products and published the results on the web. Brendan Reid, the Proven technician who took the readings at the base of the tower, used an inexpensive analog meter, simply watched the display, and recorded the maximum value. He found that in low winds their 600 watt unit was equivalent to ambient noise. The 2,500 watt model registered 5 dBA above ambient in low winds, while their 6,000 watt model was 10 dBA above ambient. Occasionally owners of small wind turbines perform similar ad hoc measurements. 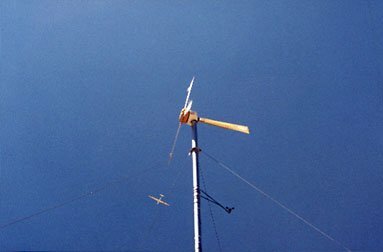 Arthur Krueger, an engineer in Vermont recorded 80-90 dBA, or 10 dBA above ambient of 70-80 dBA 100 feet upwind from the 64-foot tower of his Whisper wind turbine. Like others in the United States he used an inexpensive Radio Shack (Realistic brand) analog sound level meter. The most revealing measurements to date were those conducted by Risø National Laboratory in Denmark, and Ed Sherman at the New England Institute of Technology. Sherman's results appeared in the October, 1999 issue of the magazine Cruising World, under the title "Gear Test: A Gift from Aeolus." While the technique and instruments used were no more sophisticated than the others, this was the first time side by side measurements were made of several different turbines. See Cruising World Noise Measurements. Like the others, Sherman used a consumer-grade (Radio Shack) analog sound level meter. He too measured downwind from the turbine. What he did that the others didn't, Sherman measured the noise close to the rotor of five different turbines under similar wind conditions. 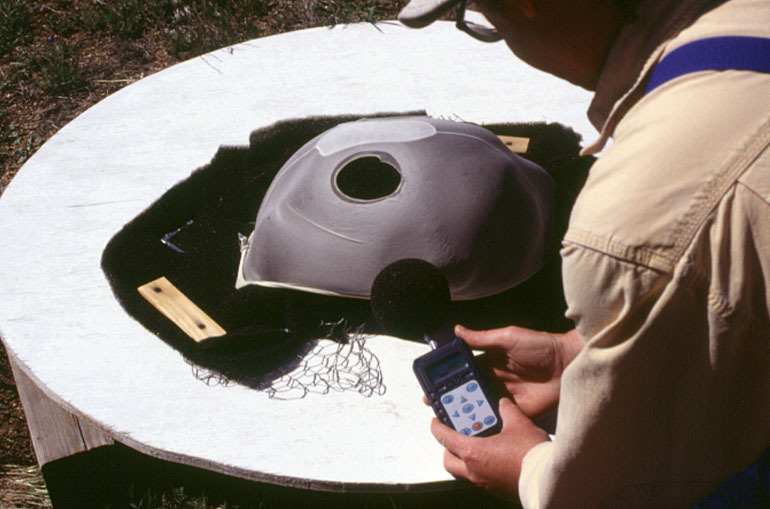 Measuring close to the rotor minimized the effect of ambient wind noise in the sound meter's microphone. What he found was striking and confirmed the subjective observations of many: SWP's Air 403 was the noisiest of the batch. Sherman explained that ". . . the blade noise emitted by this comparatively small generator was by far the loudest, emitting a screaming 102 decibels, measured 8 feet from the unit, in some of the higher gusts. During these same gusts, the other units in our test group all maintained themselves at a relatively quiet 75 to 83 decibels," he said. Wisconsin's Sagrillo finds the Air series the noisiest machines he's observed in two decades of testing small turbines. Sagrillo, has personally operated more than 30 different small wind turbines. The noise is even worse, he says, "when installed on a sounding box, such as a house. "I don't know how anyone can live on a sailboat with one of these things." "It's no mystery to cruisers [in sailboats] that these things are notoriously noisy," said Sherman. As valuable as Sherman's results were, they still couldn't answer the question of whether small wind turbines were relatively noisier than medium-size wind turbines. To do so requires using the same measurement techniques developed for measuring noise from bigger turbines. Risø performed just such tests on a series of household-size wind turbines (hustandmolle) developed under a government program. See Comparison of Noise from Small & Selected Medium-Size Wind Turbines. While several of the turbines in the Danish program are larger than what most Americans consider "small" wind turbines, the results are striking. Emissions from two of the designs were so high that the products were discontinued Risø said in a May 1999 report. 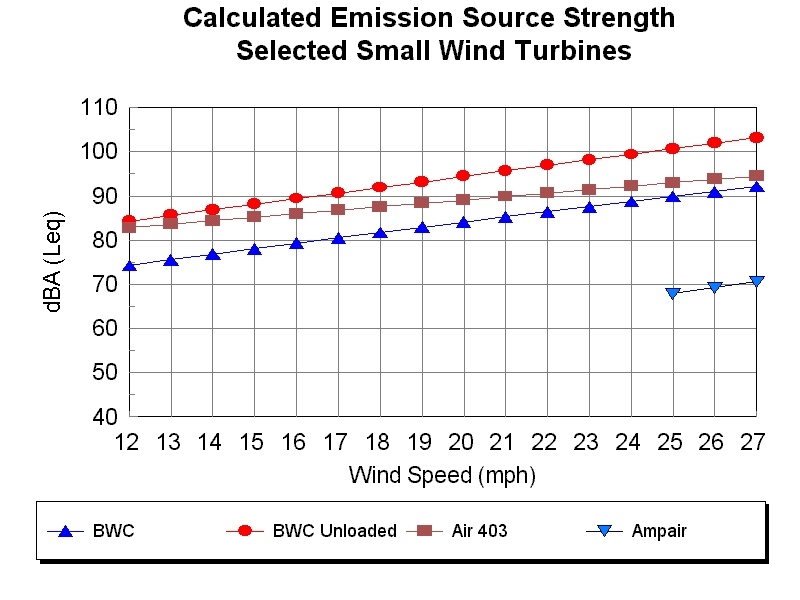 As with power curves, no U.S. manufacturer of wind turbines complies with either the IEA or AWEA noise standard. Since AWEA adopted it's "Procedure for Measurement of Acoustic Emissions from Wind Turbine Generator Systems" in 1989, the standard has been effectively forgotten. Many of the procedures in AWEA 2.1-1989 were incorporated into the section of IEA's "Recommended Practices for Wind Turbine Testing" on acoustics, "Measurement of Noise Emission from Wind Turbines," edited by Sten Ljunggren in 1994. Both standards describe the procedure for measuring sound pressure levels at a specified or "reference" position downwind of the turbine. Key elements are the use a of scientific-grade, Type 1 sound level meter, and the amount and type of data collected. For example, the standards specify a minimum of 30 one-minute samples of Leq on the "fast" meter response. Critical to the measurements is the ability to distinguish wind turbine noise from ambient noise due to wind in nearby trees or in the rustling of wind across the microphone. To do so the ambient must be at least 5 dBA below noise from the operating turbine in the AWEA procedure, or 6 dBA in the IEA method. This stymied researchers for years until it was agreed to target wind speeds between 8 m/s (IEA) and 10 m/s (AWEA) where wind noise can be managed with purpose-built, secondary wind screens. Measurements are made with the sound level meter sheltered inside the secondary wind screen mounted on an acoustically hard board at ground level. This contrasts with typical noise measurements made with a meter mounted on a tripod at chest height. The procedure also specifies the size, construction, and material used to make the secondary wind screen: a hemisphere 450 mm (18 inches) in diameter, with a 25 mm (1 inch) layer of open cell acoustic foam over a wire frame. I set out not only to measure the noise from three turbines operating at the Wulf Test Field, but also to develop a low-cost technique for doing so that could be used by small wind turbine manufacturers and experimenters alike. I adapted the standard measurement procedures to fit my budget and site. My ground board was 3.5 ft ( . 1 meter) in diameter, 3/4-inch plywood, painted white. The primary windscreen was purchased with the Sound Level Meter. For the secondary windscreen, I built a crude hemisphere out of lightweight fencing (chicken wire), and laced two layers of 1/2-inch (. 12.5 mm) open-cell acoustic foam from a local sound studio. Wind speed was measured on a tower-mounted boom at a nominal height of 56 feet (17 m) for the BWC 805, and 40 feet (12 m) for the Air 403. No attempt was made to adjust wind speed to the 10 meter height specified in the standards. This is to the manufacturers advantage. One-minute average wind speeds were recorded onto a Nomad data logger. The clocks on my laptop, SLM (when required) and the Nomad data logger, were synchronized. Precision or Type 1 SLMs are expensive, typically $5,000 or more. Small turbine manufacturers often use this as an excuse for not measuring noise from their products. The equipment can be rented, but rental may not be a wise choice. Measuring noise from wind turbines requires wind speeds in the range of 8 to 10 m/s (18 to 22 mph). Even at good sites, there can be long lulls that would rack up rental charges. I found that rental companies offered Type 1 meters for as little as $50 for the first month. Charges then jumped to $500 for the second month! Since one of my objectives was to develop an inexpensive method that could be replicated by others of limited means, I bought an Extech 407736. This is a Type 2 SLM, a cheap Taiwanese knockoff of a British meter made by Casella CEL. The digital meter cost $250 without external calibrator. The Extech meter, and others like it, is unsuited for measuring wind turbine noise. The meter displays sound pressure levels only and offers no data storage, but it does include an analog output jack. Fortunately, relatively inexpensive software is available from Great Britain that uses a PC sound card to capture the analog signal from these sound level meters, calculate Leq or exceedance levels, and store the data on the PC's hard drive. The $350 ($60 for non-profits) Jade software was designed for use with industrial-grade meters built by Casella CEL. Jade also works with copies of the CEL meters, such as the Extech. I ran a series of tests with the Extech and the Jade software. Subsequently, I experimented with a Casella CEL 269, Type 2 integrating SLM. This meter displays Leq, and includes an external calibrator, documentation, and cable for connecting to a PC at a cost $1,l00. It too must be used with the Jade software to log sequential one-minute L eq data. Due to my ineptness, I damaged the sound cards on three notebook computers before abandoning this method. A skilled technician should be able to avoid the problems I encountered. The current measurements were made on a CEL 460 noise dosimeter. This is $2,000 Type 2 instrument designed for logging occupational noise exposure. The instrument includes a calibrator with a certificate of conformance to Class 2L and ANSI S1.40:1984 and traceable to British national standards. The instrument was field calibrated before each measurement period. Traffic noise on nearby Tehachapi-Willow Springs Road (trucks or touring groups of motor cycle riders), overflights, gun shots from a local shooting range, or other "noise excursions" were noted and the one-minute sample for that period deleted from the records. Ambient noise with the turbine parked was measured before and after noise from the operating turbine was measured. I collected almost two hours of ambient and ambient plus turbine noise data (120 one-minute averages) for each condition and for each turbine. One-minute average wind speeds were correlated with one-minute Leq data downloaded from the dosimeter. Linear regressions were calculated on ambient noise (turbine parked) and on the turbine operating (turbine plus ambient). The difference between ambient and turbine plus ambient (Ls+n-Ln) was determined and the noise from the wind turbine alone was calculated (Ls). From this, the sound power level, LWA, was derived. To my surprise, the results from measurements with the cheap Extech meter coupled with the Jade software were within less than 1 dBA from that obtained with the industrial-grade dosimeter that cost four times more. The sound pressure level in Leq for the Air 403 measured at the reference distance was 57 dBA at 8 m/s and 60 dBA at 10 m/s. Ambient noise was 11 dBA less than that with the turbine operating. Thus the noise from the wind turbine alone, Ls, is the same as that of the turbine plus ambient. In winds from 8 to 10 m/s, the Air 403 is "buzzing" most of the time. At these sound pressure levels, the Air 403 Sound Power Level or emission source strength (LWA ) is 88 dBA at 8 m/s and 91 dBA at 10 m/s. See Summary of Small Wind Turbine Noise Measurements in dBA. In contrast to the tests on the Air 403, three conditions were measured on the BWC 850: ambient, turbine charging, and turbine unloaded. Significantly, the BWC 850 is noisier when unloaded than the Air 403 when charging. Unless the Air's internal regulator is switched off, the Air 403 dynamically brakes the rotor to a stop when the battery set voltage is reached. Noise emissions from the Air 403 are greatest when the turbine is charging. The BWC 850 performs differently. When the battery set voltage is reached, the regulator unloads the generator and the rotor on the BWC 850 speeds up. Noise emissions increase when the regulator unloads the generator and rotor speed increases. The sound pressure level measured for the BWC 850 charging batteries at a constant voltage was 49 dBA at 8 m/s, and 54 dBA at 10 m/s. Ambient noise was 6 and 7 dBA, respectively, below that of the noise from the turbine plus ambient. The noise from the wind turbine alone, Ls , was 48 at 8 m/s and 53 dBA at 10 m/s. 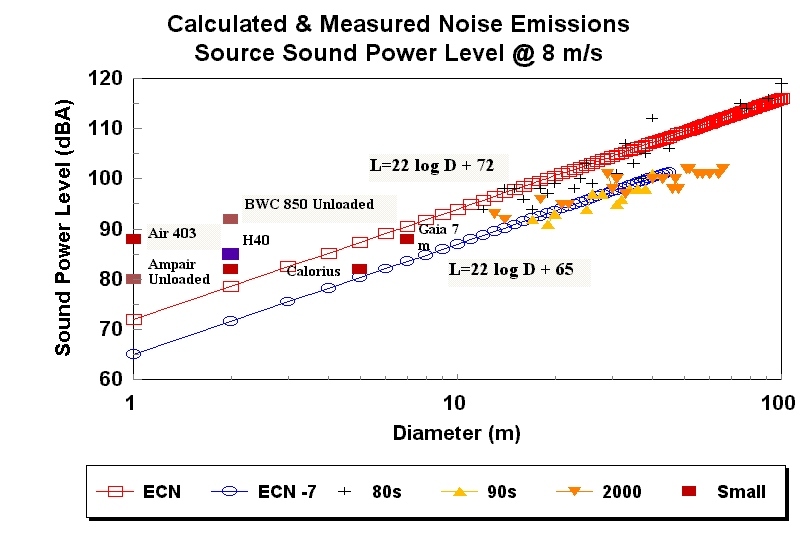 At these sound pressure levels, the emission source strength, LWA) is 82 dBA at 8 m/s and 87 dBA at 10 m/s. When operating unloaded, the sound pressure level from the BWC 850 was 58 dBA at 8 m/s and 64 dBA at 10 m/s. Ambient noise was 15 to 17 dBA lower than the turbine plus ambient noise. Under these conditions the measured turbine plus ambient noise is the same as the noise from the turbine alone. Thus, the emission source strength, LWA , for the BWC 850 is 92 dBA at 8 m/s and 97 dBA at 10 m/s. The sound pressure level for the Ampair 100 was 48 dBA at 8 m/s, and 53 dBA at 10 m/s when charging. Ambient noise was 3 and 5 dBA, respectively, below that of the noise from the turbine plus ambient. Thus, there was an insufficient difference between ambient and turbine plus ambient for statistically valid results. However, the noise from the turbine alone was 44 and 51 dBA respectively. Consequently I operated the Ampair 100 unloaded, though the manufacturer warns against operating the turbine without a load. When operating unloaded, the sound pressure level was 51 dBA at 8 m/s and 56 dBA at 10 m/s. Ambient noise was 6 to 8 dBA lower than the turbine plus ambient noise. The noise from the turbine alone was 49 and 56 dBA respectively. The emission source strength, LWA, for the Ampair operating unloaded was 83 dBA at 8 m/s and 89 dBA at 10 m/s. How, then, do these turbines compare to the well-documented emissions from larger turbines? The noise at 8 m/s from the 2.4 meter BWC 850 when unloaded is equivalent to that from a Furländer FL 30, a 13 meter, 30 kW turbine. In winds of 10 m/s, noise from the BWC 850 begins approaching that of medium-size wind turbines. See Comparison of Noise from Small Wind Turbines. Small wind turbine noise is principally a function of tip speed and shape. Some designs also contribute a tonal component from the alternator. (See side bar Sources of Small Turbine Noise) Research by Nico van der Borg at ECN found that the source strength of noise from wind turbines could be approximated using a formula based on rotor diameter, where larger wind turbines generate proportionally more noise than smaller machines. The model was derived from data on experimental wind turbines designed in the 1970s and early 1980s. Many of these early research turbines operated at very high tip speeds. Van der Borg compared them to commercial turbines available in the 1980s and estimated that the commercial turbines were as much 7 dB quieter than their predecessors. See Calculated & Measured Noise Emissions. Using van der Borg's model, the Air 403 and BWC 850 should emit no more noise than 70-80 dBA. Instead, the two small turbines are 10-15 dBA noisier than would be expected for their size. Consumer-grade instruments cam be used to measure wind turbine noise when operated with care. This opens noise measurement to experimenters and users of small turbines. Regardless of whether cheap sound level meters are used, wind turbine noise can be measured for less than $2,500. This puts the technique within the reach of all small turbine manufacturers. The type of analysis performed here could have been done years ago after the first consumer complaints about these products were heard. The data would have quantified the widespread subjective impression that these two turbines were noisy. If manufacturer's were unwilling or unable to perform these tests, national laboratories could have done so as a service to the public. The measurements would have also helped small turbine manufacturers address an issue seriously affecting the acceptability of their products. Paul Gipe is the author of Wind Power for Home & Business, Wind Energy Comes of Age, Wind Energy Basics, and Energía Eólica Práctica. He also measured noise from traffic in the mid 1970s. Michael Klemen, a wind experimenter in North Dakota has posted the sound from two wind turbines on his web site hosted by North Dakota State University. One file plays the recorded sound of an Air 303, the other of a Bergey wind turbine. The audio clip of the Air 303 operating in winds of 40 mph was recorded by Minnesota's onetime "windkid" Corey Babcock. In the audio file, the two distinct sounds created by the Air are discernible: the alternator growl, and the "buzzing" when the blades flutter. Klemen's page also contains clips of a small Bergey Windpower turbine recorded using his notebook computer's built in microphone. Local noise ordinances typically state the acceptable sound pressure level in dBA at the property line or nearest residence, because noise measurements are commonly made in these units. However, the models used to project noise levels surrounding a wind turbine use the acoustic energy created by the machine, and not sound pressure directly. Acousticians use field measurements of sound pressure levels, or Lp , to calculate the sound power levels, or L w emitted from the wind turbine. As if the similar-sounding names were not confusing enough, both noise measures use the same units, dBA. While sound pressure levels will always be specified at some distance from the turbine, the sound power level will always be presented at the source: the wind turbine itself. The distinction is important. The sound power level of most commercial wind turbines varies from 95 dBA to more than 100 dBA. Yet a wind turbine emitting a sound power level of 100 dBA can meet a 45 dBA noise limit in sound pressure level given sufficient distance. Sound Power Level (Lw) = (Lp-6 dB)+10 log (4 BR2) where R is the slant distance from the turbine to the SLM, Lp is the sound pressure level measured by the SLM and -6dB is the correction for using a reflective sound board. The time-weighting of noise is expressed as the noise exceedance level: the amount of time the noise exceeds a specified value. For example, L 10 is the noise level exceeded 10% of the time; L90 , the noise level exceeded 90% of the time; and Leq, the continuous sound pressure level which gives the same energy as a varying sound level. A noise standard of 45 dBA L90 is stricter than a standard of L 10 , because 90% of the time the noise must be below 45 dBA. Wind turbine noise is measured in Leq in order to calculate the sound power emitted by the turbine. Wind turbine noise is largely a function of tip speed and blade shape, especially near the tip. And unlike medium-size turbines, many of which operate at constant tip speeds, nearly all small turbines operate at variable speeds. As wind speed increases, so does tip speed--and noise. See BWC 850 SPL Summary at Wulf Test Field. Many constant-speed, medium-size turbines operate at tip speeds around 40 m/s in low winds when their low-power windings are energized, and 50-60 m/s when the generator windings are fully energized. Some medium size turbines, especially variable speed machines, can reach tip speeds of 100 m/s. For example the Dutch NEWECS 25, an early 25 meter diameter variable speed turbine, would operate at a tip speed of 100 m/s in high winds and generate 108 dBA L WA in sound power. Growian, Germany's giant experimental turbine of the early 1980s could reach tip speeds of 110 m/s. For comparison, the Air 403 reaches a tip speed of 92 m/s in winds of 10 m/s, and its tip speed continues to increase until the blades begin to flutter. When unloaded, the BWC 850 reaches a tip speed of nearly 70 m/s. While this may seem a modest speed in comparison to the Air 403, the Bergey pulltruded blade is quite different from the saber-like shape of the Air 403 blade. Since the late 1970s, Bergey turbines have used a pulltruded fiberglass blades. These blades, while extremely durable, have a thick trailing edge. Jim Tangler, an aerodynamicist at NREL, attributes much of the noise from the Bergey blades to the tip vortex interacting with the thick trailing edge of the cambered blades. In contrast, the trailing edge of the Air 403 blade is so sharp, Southwest Windpower warns users to wear gloves when assembling the rotor. See Specifications of Small Wind Turbines Tested. Measurements on the BWC 850 at the Wulf Test Field reveal that the turbine is noisier than the Air 403 when the Bergey turbine is operating without a load. Small wind guru Mick Sagrillo has been vocal in his criticism of noise from the Air 303-403 series, but Bergey's 1500 also draws his ire. It's "the noisiest turbine we've ever run here in standard operating mode." When batteries are fully charged, for example, the Bergey controller unloads the alternator allowing rotor speed to increase noticeably. Sagrillo's quick to point out that the version he operated used pitch weights and blade tip designs that Bergey has since abandoned. For example, earlier versions of Bergey's characteristic pulltruded blades used square tips. Later versions use tapered tips. Dave Blittersdorf of NRG Systems operates a 7-meter (23-foot) diameter Bergey Excel in the backyard of his home near Burlington, Vermont. A keen observer, Blittersdorf noted that the Excel was noisiest when the controller unloaded the rotor. leading to higher tip speeds. To keep the neighbors--and his wife--happy, he now ensures that his turbine always operates under a load. He also installed what he calls "trip strips" on the lift side of the blades to reduce turbulence at the trailing edges. As a result of his experience, Blittersdorf recommends that anyone using a Bergey in a battery charging application should install a diversion controller and dump load. The controller will divert any excess generation to the dump load. The dump load will keep the rotor rpm and tip speed down, reducing noise. Sagrillo explains that aerodynamic noise can be especially noticeable in small turbines, such as Bergeys, that change the rotor's plane of rotation to limit power in high winds. This furling behavior differs from one design to another with a resulting difference in noise emissions. Turbines built by Bergey, World Power, and African Wind Power all furl the rotor horizontally toward the tail vane. "There's less furling hysteresis in the AWP design and in World Power's angle governor" than in the Bergey line, says Sagrillo. "Hugh [Piggott, designer of the AWP], and Elliott [World Power's principal] have accomplished the same thing in slightly different ways. Older World Power turbines, and the Survivor brand furl the rotor vertically. According to Sagrillo and others, these designs sound like a helicopter when furling. Sagrillo says noise from the Survivor "was unreal when it furled." Noise measurement and reporting techniques designed for medium-size, constant-speed wind turbines may not adequately reflect the noise signature of these turbines. European manufacturers of medium-size turbines report sound power levels at 8 m/s (18 mph) and sometimes also at 10 m/s (22 mph). However, small turbine noise is often most objectionable at furling speeds near 14 m/s (30 mph). 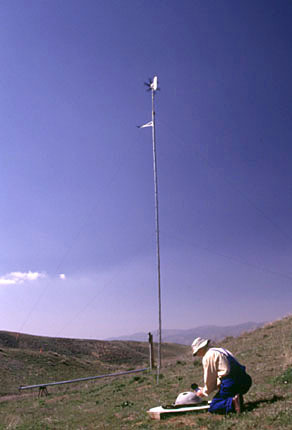 To grapple with this phenomena, NREL's Arlinda Huskey recorded noise from a World Power H40 through furling wind speeds in spring 2001. Most airfoils were designed for higher Reynolds numbers than those encountered by small turbines. "At lower Reynolds' numbers, the viscous forces are more dominant," says aerodynamicist Tangler. "At these low Reynolds' numbers the air begins to act more like water," he says. If airfoils are designed "with the right Reynolds' number for the application, airfoils shouldn't be a significant noise source." Small turbine manufacturer's may be getting that message. "Noise is a concern," says BWC's Mike Bergey. The Oklahoma company is now introducing new airfoils to replace the cambered blades that were the hallmarks of the Bergey design. The new airfoils were designed in-house, says Bergey, specifically for small wind turbine applications. Proven Engineering also plans to design special purpose airfoils for their unique downwind turbines. Noise is the "absolute number one complaint," about the Air 303-403 design, says Dave Calley, Southwest Windpower's chief designer. "It's a very important issue to us." While SWP has quantitatively measured noise with a microphone one meter from the blade tips, the "most important instrument to us is the human ear. How it sounds to me is the most important measure," says Calley, who lives with several of the turbines on the roof of his home. Calley expects to introduce a new model to replace the Air 403. Dubbed the Air X, the new turbine abandons blade flutter for power control, and eliminates the growl found when the alternator is generating more than 100 watts through a redesign of the micro turbine's power electronics. Noise problems with small turbines are similar to those of the big machines, explains Calley. But manufacturers of commercial-sized turbines have done a better job of addressing them. Small turbine manufacturers have, by necessity he says, been more focused on reliability of the sometimes trouble-prone machines and on corporate survival than on reducing noise. But "the small turbine industry is maturing," he says. Small turbines need not be noisy. Among micro turbines, the "Marlec is remarkably quiet," says Wisconsin's Sagrillo. That's similar to Ed Sherman's findings in his tests for the magazine Cruising World. Among household-size turbines, the 1930's-era Jacobs, and the 1980s turbine of the same name were extremely quiet. And, ads Sagrillo, "the AWP and Proven 2500 are every bit as quiet as the Jacobs." To Sagrillo, a wind turbine's quiet "when you have to go outside to see if it's running--that's quiet."